NAKAJIMA J8N1 KIKKA Late in the war, the Japanese were shipped a complete Me-262 by submarine. 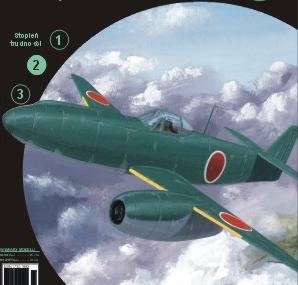 They began work on a copy of the fighter, designated the "Ki-201 Karyu (Fire Dragon)", but it was never completed. They did build and fly a smaller derivative, the "Nakajima J8N1 Kikka (Orange Blossom)", as an attack aircraft for the Imperial Japanese Navy (IJN). The Kikka looked enough like an Me-262 to be mistaken for it, though its rear fuselage was distinctively different, not tapering towards the tail, and its empty weight was about half that of the Me-262. The Kikka had folding wings, apparently to permit concealment in caves and the like, as whatever carriers the IJN had were quickly finding their way to the bottom of the Pacific. It was not fitted with guns, armament consisting of a single 500 kilogram (1,100 pound) or 800 kilogram (1,760 pound) bomb. The Kikka was powered by a pair of "Ne-20" turbojets with 475 kilograms (1,050 pounds) thrust each. The Ne-20 was a scaled-down derivative of the BMW-003, designed from photographs provided by the Germans. The Kikka used a pair of solid-fuel "rocket-assisted take off (RATO)" boosters to help get it off the runway. Two prototypes of the Kikka were built. The first was rolled out on 25 June 1945, and made its first flight on 7 August 1945, the day before the first atomic bomb was dropped on Hiroshima. This aircraft flew for a second time on 11 August 1945, but was lost in a flight accident. The second prototype was completed but never flown, and taken to the US by the Americans after the war. Plans had been made to put the Kikka into production, but the manufacturing plants were destroyed by USAAF bomb raids. Other variants of the Kikka were planned, including a two-seat trainer, an unarmed reconnaissance aircraft, and an interceptor with twin 30 millimeter cannon. Improved "Ne-130" and "Ne-330" powerplants, with about 900 kilograms (1,985 pounds) thrust, were also in development for the advanced variants. Under the circumstances, all the developments of the Kikka were little more than fantasies. The fact that the Japanese actually built two prototypes was remarkable in itself, given the state of Japanese industry at the time.